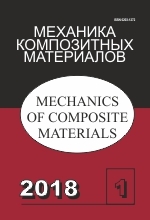 Международный научный журнал "Меxаника композитныx матеpиалов" ("Mechanics of Composite Materials") выходит 6 раз в год с 1965 г. (до 1979 г. "Механика полимеров"). С нами сотрудничают ученые всех стран мира. Academic OneFile, Academic Search, Chemical Abstracts Service (CAS), ChemWeb, CSA, Current Abstracts, Current Contents/Engineering, Computing and Technology, Earthquake Engineering Abstracts, EBSCO, EI-Compendex, Engineered Materials Abstracts, Gale, Google Scholar, INIS Atomindex, INSPEC, Journal Citation Reports/Science Edition, Materials Science Citation Index, OCLC, Polymer Library, ProQuest, Reaction Citation Index, Science Citation Index Expanded (SciSearch), SCOPUS, Summon by Serial Solutions, VINITI - Russian Academy of Science. Вы можете загрузить буклет журнала.